Back in January 1994, I was a recent college graduate working my first professional job. Winter had hit with a vengence that year, my 2-seater sports car wasn’t going to cut it on the snowy and icy roads. 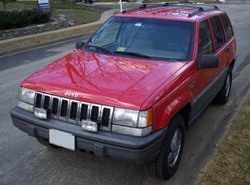 The solution was the purchase of a brand new 1994 Jeep Grand Cherokee Laredo. It was loaded with all the options including the 220 horsepower 5.2 liter V8 and leather seats. Though I have owned many vehicles over the years the Grand Cherokee was my goto vehicle. It had the perfect balance of comfort and rugged functionality. To find my Jeep, I went to a few Jeep dealerships until I stumbled across the loaded flame red Grand Cherokee with medium driftwood color interior that I wanted. The MSRP price would have been $30,010 if had not been for the $900.00 Jeep discount and $500 V8 discount listed on the sticker. With a little wheeling and dealing I got the price dropped to $26,400 which was steal considering Grand Cherokees were selling as fast as they arrived at dealerships that year. After-all it was Motor Trend’s 1993 “Truck of the Year” and 4Wheel & Off-Road’s 1993 “4×4 of the Year” and with their attractive exterior styling, Grand Cherokees were in high demand. I drove it in the worst snow and ice storms over the years, and not once did it ever flinch. It was in these weather conditions this vehicle really shined. Its full-time 4-wheel drive quadratrac system always kept its four wheel firmly planted with perfect balance and ample traction. Though I drove my Grand Cherokee many miles, almost 165,000, I always took care of it. 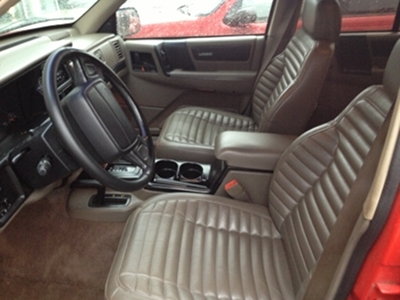 Leather conditioner was used on the seats at least 4 times a year. It was washed, cleaned, waxed, and detailed on a regular basis. It was serviced on a regular basis at the local Jeep dealership. Only once did it leave me stranded on the side of the road, at around 120,000 miles when the fuel pump failed. Other than that it was as reliable as sunshine. What was so amazing, is that it had many of the original parts still on it when I sold it, such as the original shocks and original starter. When I traded in my Grand Cherokee when I purchased a new Jeep, I received only $1,200 for it. It had a new set of Goodyear Wrangler Silent Armour tires that were worth almost that amount. The exterior looked like the day I bought it, back in 1994, with a shiny paint job with no exterior rust. The leather interior was pristine with no fading or cracking, the seats still looked new. Pretty impressive for a car that spent 20 years camped outside. Of course I did use a car cover on a regular basis to protect the car’s finish. When I traded in the Grand Cherokee, I figured with its excellent overall condition it would easily find a new home and it would continue to serve its next owner for many years. It was a nicely preserved example of an early first generation Grand Cherokee, that any Jeep fan would certainly appreciate and continue to maintain in the same fashion. 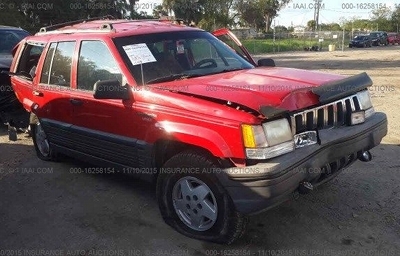 One day recently when I had a little extra time, I started researching what happened to my old Grand Cherokee and to my astonishment I discovered it had been salavaged and parted out into pieces at a junkyard, a little over a year after I had sold it. According to this information, my Grand Cherokee had been in an accident and totaled, the insurance company ruled it a loss. Hopefully no one was hurt in the accident, but the end result was the death of a great Jeep. The only consolation in this sad story, is that its parts can be used to keep other Grand Cherokees running for many more years. As sad as this story is, the memories of my Grand Cherokee will live on. Thank you Jeep Grand Cherokee for the 20 years of fun and reliable service you provided me, I will never forget you!